The opening words, “feelings were for fools,” set the stage for successful pianist Daniel Moreau and the woman who has been on his mind for nine years, Christiane Lawrence. Daniel has not played the fool for nine years and he is determined not to start now just because Christi has entered his life again. She is unaware of the power she has to easily destroy him, and that makes her the most dangerous person in his life. The female protagonist is strong in her love for her daughter and her desire to learn about her family history. She has learned through bittersweet experience to follow her head and not her heart, yet is quite aware how quickly her heart can overtake rational thought. The setting is Quebec City at the approach of Mardi Gras. The city is filled with life and fun and celebration. Christi is joyful at her vacation far from her Texas home, happy to discover her roots through an old family friend. This vacation is meant to help her recover from a recent tragic loss. She is grateful for the attentiveness of her host and oblivious to the darkness that cloaks her. As Daniel re-enters her life, Christi quickly discovers how strong, and deadly, family ties can be. 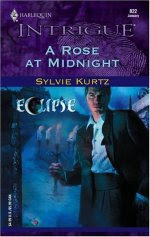 A Rose at Midnight is refreshing in its ability to pull readers into another time and place. Sylvie Kurtz piques our interest early and raises the intrigue slowly and gently until it peaks at crescendo. Then the story eases down to a soft pianissimo that leaves us feeling satisfied.